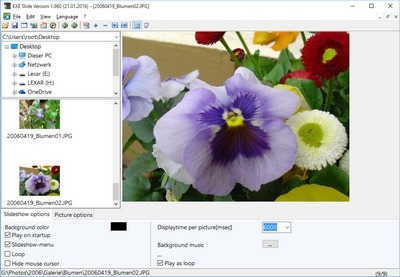 A program to create self-executing slide shows or GIF-animations. The display time for each picture can be set for the complete slide-show or individually per picture. For .EXE- or .SCR-files you have also the possibility to add a background music file. You may install this program together with Alternate Pic View and it integrates itself into the Tools-menu.